YouTube is home to some of the best makeup and beauty gurus in the world, and once a year they give us tons of creative Halloween makeup tutorials, most of which they seem as excited about as we are. That's probably because for makeup lovers, Halloween is the one time that we can confidently wear that neon-green eyebrow tint we bought at Sephora a few months ago. Halloween is the one night of the year that we can put our makeup skills to the test and see what new looks we can create. We've collected some of our favorite glamorous, totally-not-scary makeup tutorials for Halloween costumes. These tutorials range from beginner level to advanced, and some involve theater makeup while others involve drugstore makeup...but that doesn't mean that you can't adapt your own version of any of them. Part of the fun of these videos is getting your creative juices flowing. Do you have any Halloween makeup looks of your own? If you want to share some with us, we'd be happy to include you on the list! Makeup guru Kandee Johnson already had short hair at the time of this tutorial and she admits that she might resemble Miley, but she still nailed Miley Cyrus' makeup in the "Wrecking Ball" video. If you're planning on going to a party out on the town, this costume is absolutely going to get you noticed. How you include the actual wrecking ball is on you, though. We're just giving you a helpful makeup tutorial. From the straight-across eyebrow shape to the plastic-looking creased lips, Kandee really focuses on the details in this tutorial. She also gives you a mini tutorial on how to chalk your hair, in case you need to temporarily change your hair color for the costume. This Halloween you can expect to see quite a few Hunger Games outfits, and Effie Trinket being one of the most over-the-top antagonists in the book/movie makes her a perfect character for a Halloween costume. Klaire De Lys uses pink with blue undertones, and some powdery sky blue colors to achieve Effie's look. You might not think that Effie has a dramatic look, with her use of soft and light pink colors...in fact, it might be how you do your own makeup on date night. But Klaire's finished look ends up looking gorgeous, especially the blue lip liner with the soft pink lipstick. Pair this makeup with an over-the-top, gaudy outfit from the thrift store and you've got your look. Technically, this isn't a tutorial because Brittany provides no audio throughout the video. But if you pay close attention, you'll be able to recreate what she did and make your own version, because we all know that Ursula is truly unforgettable. Using a light purple paint as a base and dark purple paint for contouring, Brittany creates a dramatic recreation of Ursula, complete with the electric blue eyeshadow and theatrical, painted-on eyebrows. There are quite a few sugar skull (or Dia de Los Muertos) tutorials out there, but this is one of our favorites. Maybe it's because the circles around her eyes are blended out and not so defined. Or maybe it's the amazing bone hand ornament she's wearing.Harlow uses rhinestones to frame the painted circles around her eyes and brings the skull look down to her chest by adding a painted exposed sternum. She also wears the signature Dia de Los Muertos flower crown. With Book of Life coming out next week, this could be the perfect Halloween costume for parties. If you have little ones who are still wrapped up in the Frozen phenomenon (or if you like Frozen as an adult) you can nail the look of Queen Elsa with this tutorial from Promise Tamang, AKA Dope2111. Elsa's makeup look consists of thin, dramatic, dark eyebrows and bright purple eyeshadow. If you don't have thin lips like Elsa, Promise shows you how to thin your lips using some extra foundation and some lipstick and blush. Whether you call her the Red Queen or Queen of Hearts, Tim Burton's adaptation on the curmudgeonly old queen is a makeup lover's dream Halloween costume. With electric blue eyeshadow, dramatic pencil-thin eyebrows, and a red heart-shaped lip, the Red Queen is hard to forget. Heather, AKA Sokolum79's tutorial sticks out among the rest of the Red Queen tutorials because she chooses to use a bald cap, which actually makes her version stand out, and it's one of the best (if not THE best) we've seen. Even though Miss Argentina was only in Beetlejuice for a few seconds, most young women who saw the movie will never forget her. Maybe that's because even though she was dead, and a strange shade of blue/green, she was still so glamorous. Sam from Pixiwoo uses a paint stick from Mac to achieve Miss Argentina's signature cyan body color and a vibrant purple eyeshadow to create some contrast. She also provides some interesting commentary about the 1998 movie, including the fact that Michael Keaton took only 2 weeks to film his part in the movie, and he's only in it for about 18 minutes. It happens to be his favorite role. If you're in need of a last-minute Halloween costume, a pinup girl is a glamorous and elegant choice. Head to a thrift store and pickup a cute dress, watch this makeup tutorial, and follow up with a hair tutorial. If you don't have time to do an intricate hair style, simply curl your hair and put a flower or bandana in it.Pala Foxxia walks you through this pinup makeup tutorial and embodies pinup culture with her matte red lips, faux beauty mark, and cat-eye style eyeliner. Here's another quick and easy makeup tutorial for a Geisha costume by makeup and style YouTuber Michelle Phan. This is a tutorial that you can learn from, and then adapt for yourself based on the look you want to achieve. The best part is that throughout the video, Phan shows us where she gets all her makeup, sometimes it's CVS! Here's another simple Halloween costume you can do on the fly if you don't have anything planned yet: a ventriloquist dummy. Bridgitte from Eyedolize Makeup gives a great tutorial using products that you probably already have in your makeup collection. This is a fabulous tutorial for beginners, so if it's your first Halloween experimenting with costume makeup you should definitely try this one. A bonus is that the clothing part of the costume is simple: a solid white button-up shirt tucked into some highwater pants. Oh, and a bowtie. You can't forget the bowtie. You can pick up all of that stuff at your local thrift store. 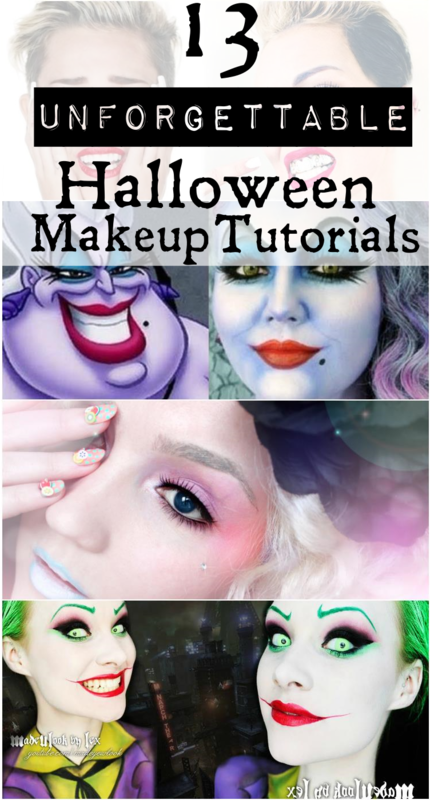 If you love Tim Burton's version of The Mad Hatter and want to do a female version, Nicole Guerriero does a great job at capturing his look and applying it to a fresh female face. We especially love the dramatic pink lip liner with the peachy pink lipstick and the adorable mint-colored "freckles". Also, any excuse to wear colored-contacts is great, so props to Nicole for popping in some green contacts. The green eyes really pop against the orangeness of the female Mad Hatter. Lex from Made U Look is obviously a talented makeup artist. You might think that this is too advanced for you, but you could probably have a firedn draw on the tattoos if drawing in the mirror isn't easy for you. The Joker is all about the blood red lips, porcelain-white skin, and green hair. Lex's version of the Joker is more of a mix between Jared Leto's Joker and the comic book version of the Joker. We had to include this adorable Harley Quinn tutorial, since Harley is The Joker's counterpart. This version of Harley pairs great with Lex's version of The Joker, so it could be a great couple costume if you're willing to put in double the work. There are a lot of different adaptations of Harley Quinn, but this is a great starting point especially for beginners. Also, it's great to know that even the expert makeup artists still use the tried-and-true tape trick to ensure that you get a flawless cat eye. How amazing are these?! And maybe check out our post on how to throw an awesome adult Halloween party.